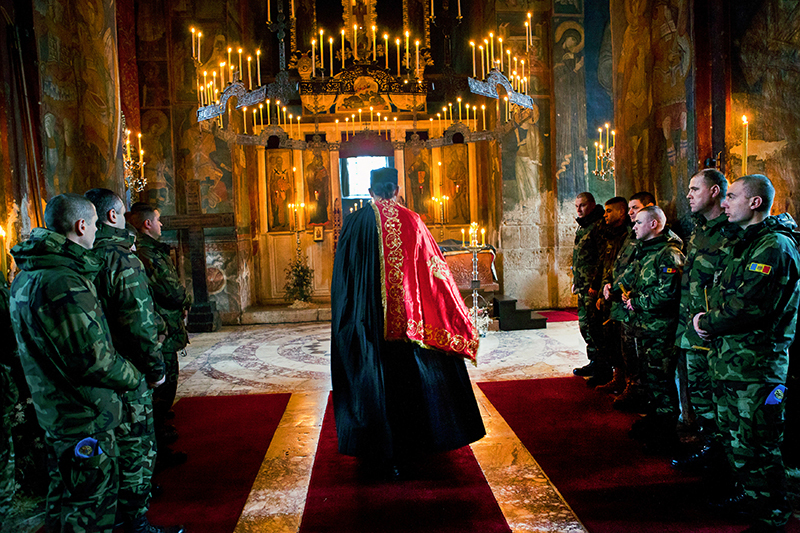 Orthodox priest is holding a Christmas service in the monastery of Visoki Decani in Kosovo, surrounded by the soldiers of KFOR who are in charge of protecting the monastery. Soldiers from different countries often attend services, although many of them are not Orthodox. Monastery was attacked from the nearby hills in 2000. and 2004. with a mortar, and several incidents were recorded in the recent past: In 2014 ISIS mark was left on the front gate and in January 2016 four armed men were arrested by Kosovo police in front of the monastery. They had rifles with ammunition and radical Islamist literature in the car. 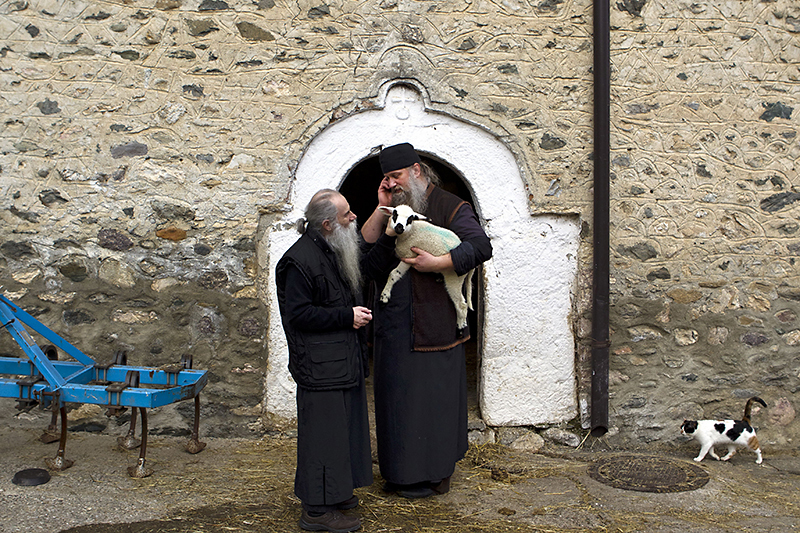 Two men from the region of Urosevac came to monastery of Visoki Decani on a Christmas day. They got a donation by Serbian Orthodox Church in the form of two piglets. Piglets are traditionally prepared in Serbian households after the Christmas fasting. Orthodox Church in Kosovo, main institution of spiritual life for remaining Serbs, often donates different necessities to remaining citizens. 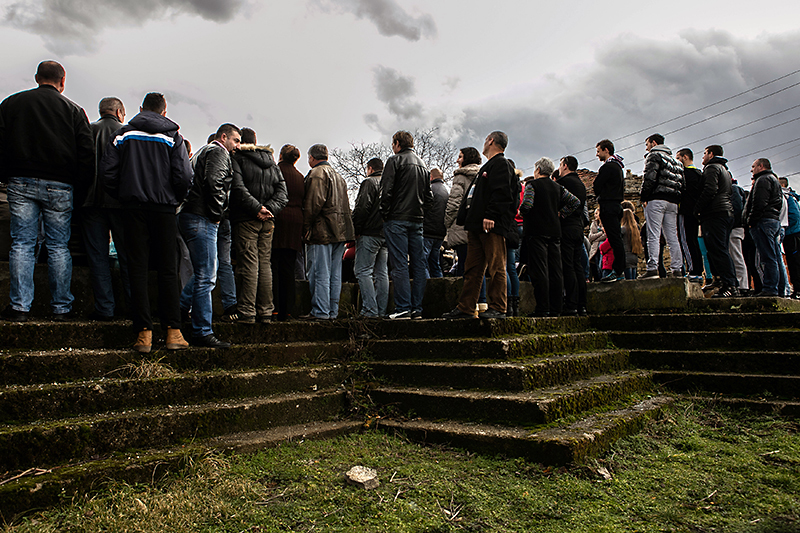 Residents of enclave Velika Hoca all came to the center of the village to watch the play by Serbian theatre from Gracanica, whose members were forced to leave Pristina and former unique Serbo-Albanian theatre when the war started in 1998. Nowadays, they are having occasional tours through enclaves where they sometimes play for only few remaining Serbs. Velika Hoca suffered several attacks during the war and was under armed protection of KFOR long after. Even today, strong impression of isolation is present among it's residents. Events like this one, when they can enjoy play in their own language, are very rare. 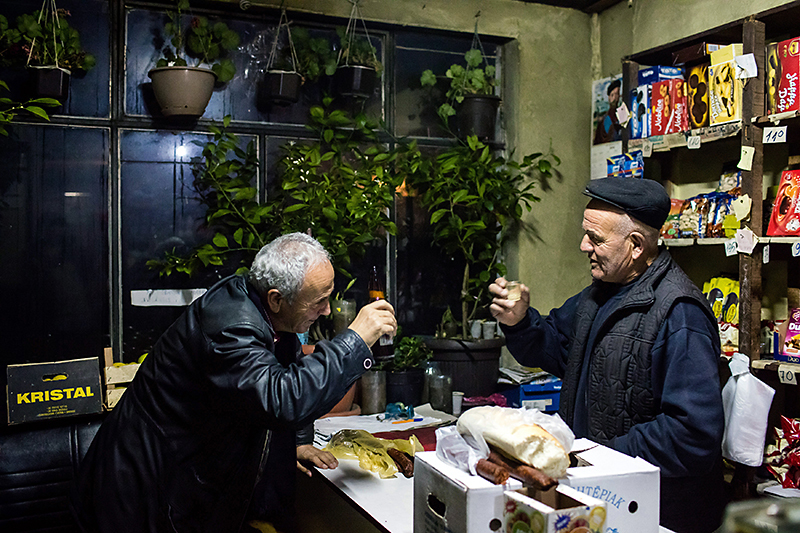 Two old friends from period before the war, Seljami and Stajko, are toasting in a small store belonging to the latter, in the village of Velika Hoca inhabited by Serbs. Seljami, who is Kosovo Albanian, comes here often from nearby Orhovac to meet his Serbian friend, without fear that anything could happen to him. He stays for hours, talking with Stajko in clear Serbian language, about the past times when ethnicity and religion didn't mean that much as they do today in this region. 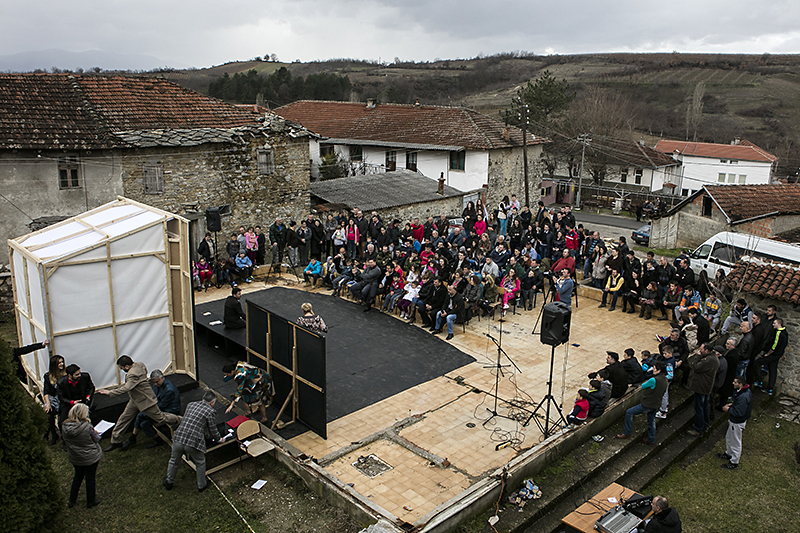 Serbian national theatre from Pristina, now located in Gracanica, performs in front of the audience from isolated Serbian enclave Velika Hoca. Members of the teatre were forced to leave Pristina and former unique Serbo-Albanian theatre when the war started in 1998. Nowadays, they are having occasional tours through enclaves where they sometimes play for only few remaining Serbs. Velika Hoca suffered several attacks during the war and was under armed protection of KFOR long after. Even today, strong impression of isolation is present among it's residents. Events like this one, when they can enjoy play in their own language, are very rare. 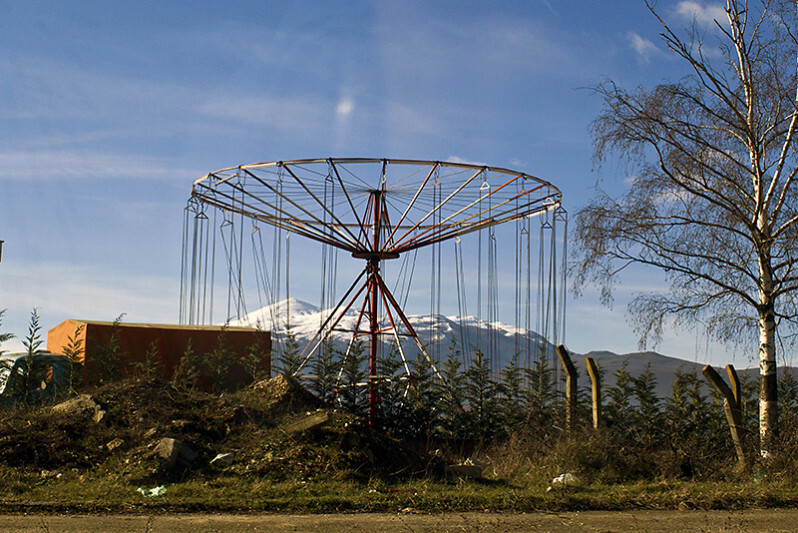 Merry-go-round is seen along the road between Djakovica and Prizren in Kosovo. Living standard of people in Kosovo is very low, and one can see many unfinished and deserted object along the way. Church of Saint Georgie in Prizren has been renovated from donations by Serbian Orthodox Church recently. Today it's still under protection by Kosovo police, but in bigger cities like Prizren the tension is not that present nowadays, partially due to the fact that there are no people of Serbian origin left today in this area. Only couple of priests and students of theological school still live there. Before the war, almost 12000 people of Serbian ethnicity lived here. 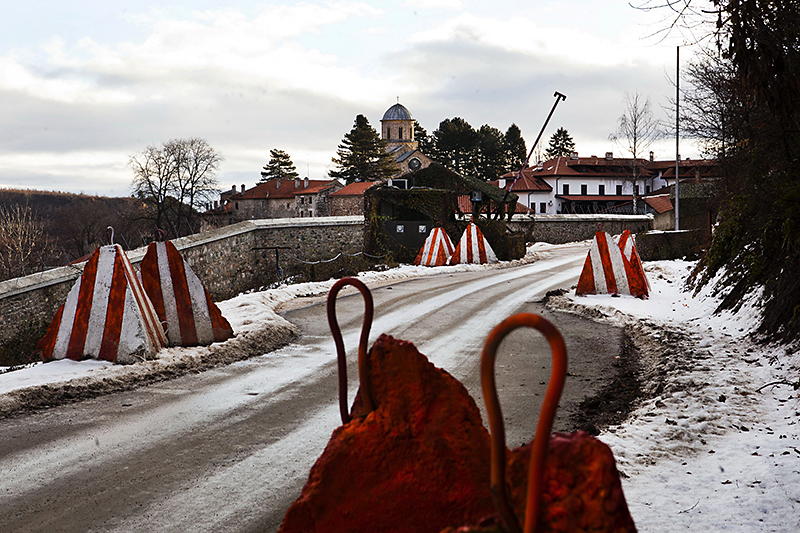 Barikades are permanently installed in front of Visoki decani monastery. Heavily armed KFOR soldiers are still in charge of protecting this Serbian monastery placed deep in the therithory of Kosovo Albanians. 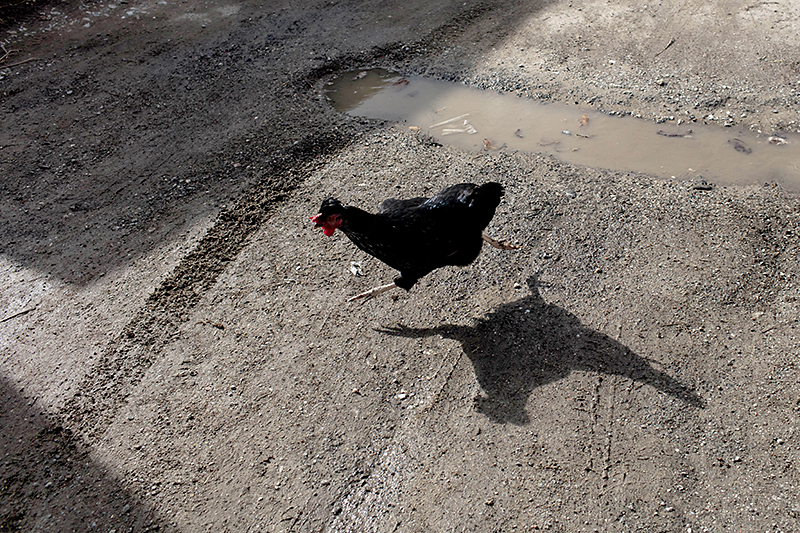 Chicken is running over the road in Velika Hoca, Serbian enclave in Kosovo. Shadow of a man working ih his garden on the terrace in Serbian part of Orahovac. 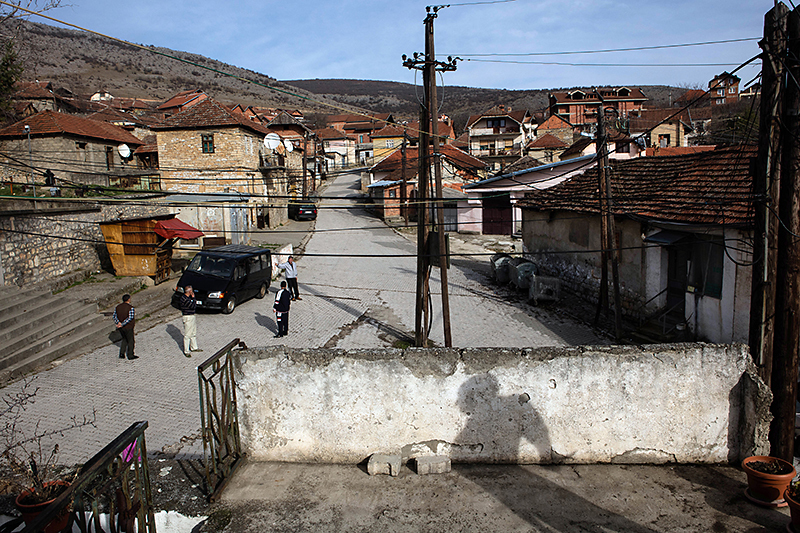 Orahovac is one of "shared" settlements where Serbs and Albanians live in complicated coexistence. Only a few dozen of Serbs stayed to live in isolated part of the town on the hill, where they still inhabit area consisting of several streets. Before the war, over 2000 people of Serbian nationality lived here. Priests trying to catch mobile signal in front of the economy of monastery Visoki Decani. Until recently, only in some zones of the monastery it was possible to catch the signal of Serbian mobile operators. Monastery is deep in the terithory inhabited by Kosovo Albanians, close to the border with Albania. It has been atacked multiple times after the war. Priests developed their own economy for the needs of the monastery, so they are not completely dependent on regular purchases and distribution of goods by KFOR. 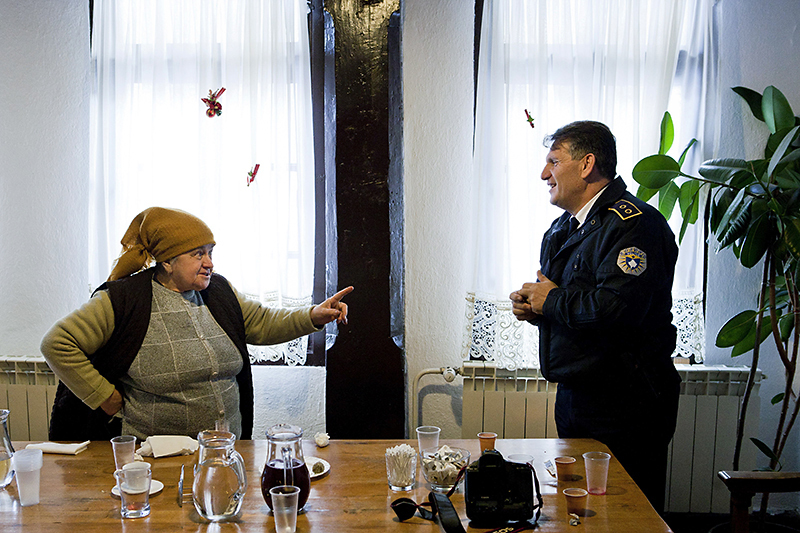 Old woman, resident of the city of Djakovica, speaks with the commander of Kosovo police for the district of Decani in the guestroom of monastery Visoki Decani. She and three other women are the only remaining Serbian resident of the nearby town of Djakovica in Kosovo. Before the war, number of residents of Djakovica who were Serbs was 12.000. The lady said that this commander took very good care about remaining Serbs. 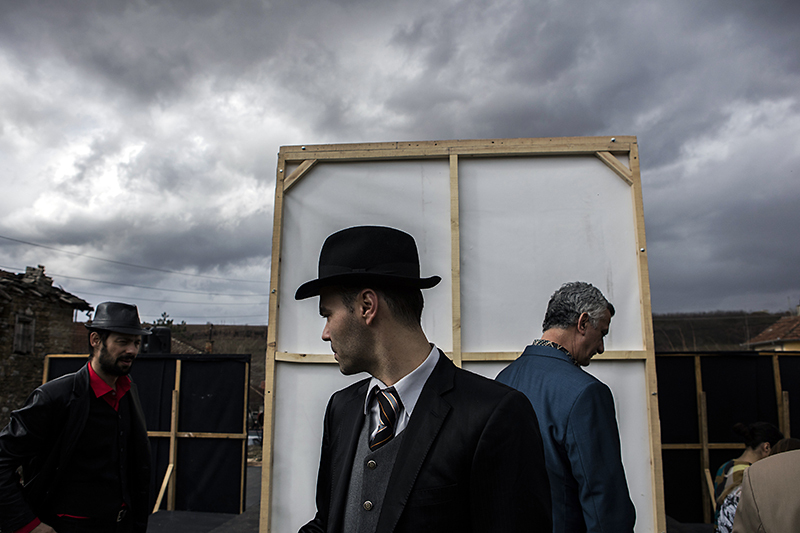 Members of National theatre from Pristina (now located in Gracanica), move behind the scene during the play, while they performe in front of the audience in Serbian enclave of Velika Hoca, under threat from the approaching storm. Pristina theatre was unique institution before the war, shared by different ethnicities, where Albanian and Serbian performing artists created together side by side. Serbian members were forced to leave the city after the war, in 1999. After this, they established a new independent theatre located firstly in Kosovska Mitrovica, and later in Gracanica, Serbian settlement near Pristina. From time to time they organize tours through Serbian enclaves and places in Kosovo where Serbs still live today. Sometimes they play in front of only few remaining residents of Serbian nationality. 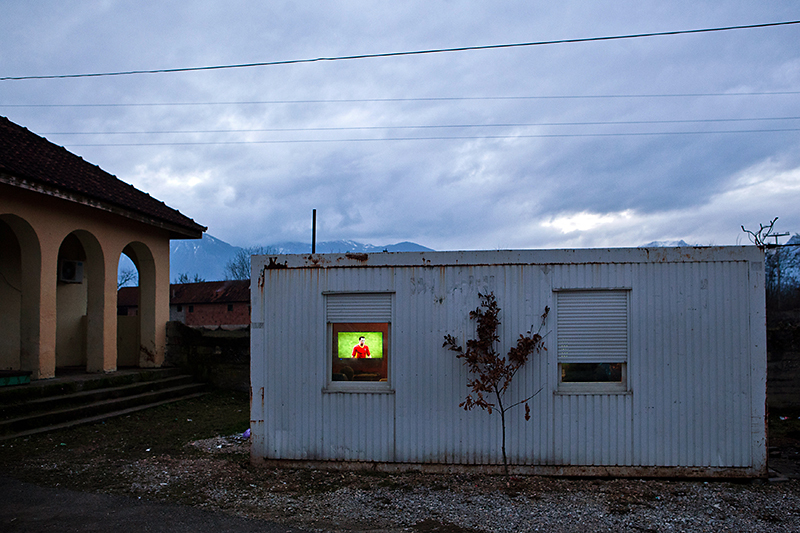 Old container serves as a game room in the city of Gorazdevac. Oak tree in front, symbol of Orthodoxy, is a sign of recognition, showing that this playground is used by Serbian youth. 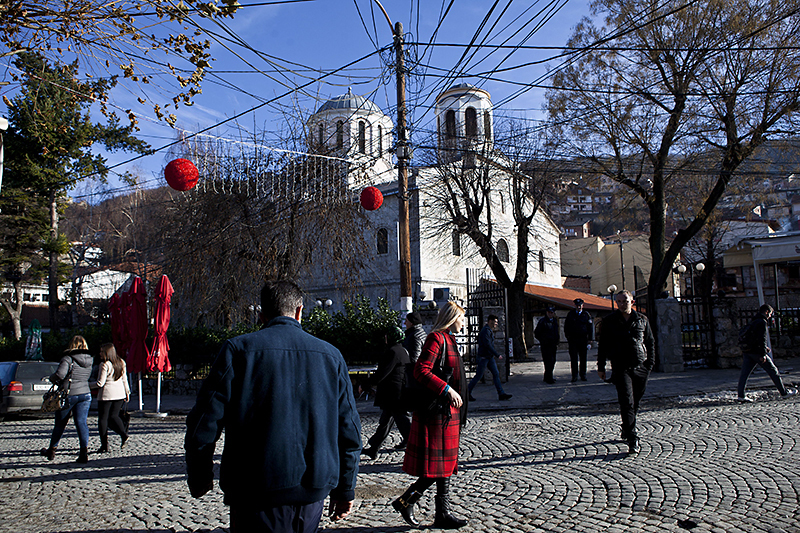 Gorazdevac is divided city, where Serbs and Albanians live in complicated coexistence. 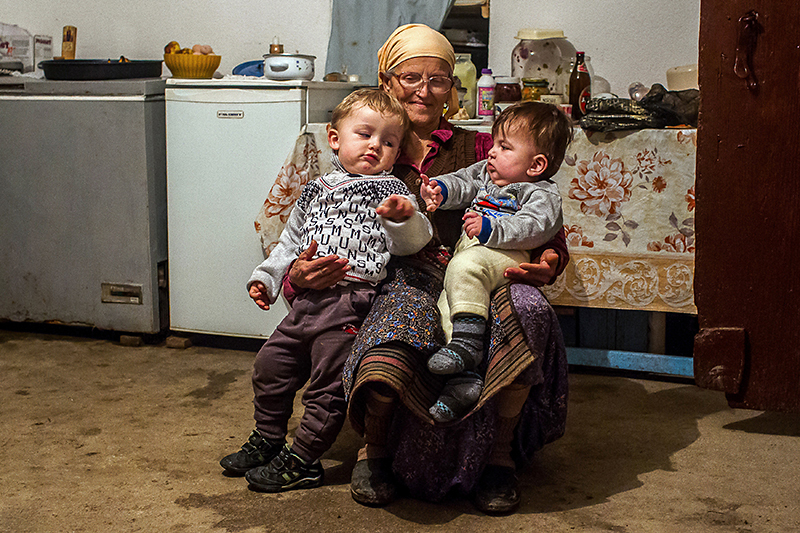 Mrs. Radmila Simic is holding her two grandsons, Stefan and Aleksa, in an old house of family Simic in Serbian enclave Velika Hoca. They were born in mixed marriage between Kosovo Serb Krsta Simic and his wife Pranvera who is Albanian. 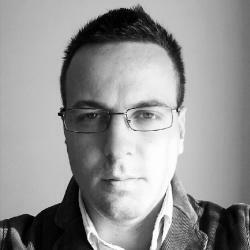 Pranvera came to Velika Hoca few years ago, when Krsta went to Albania to propose on her. They live today in harmonious marriage despite all the differences, although from time to time they feel like they are discriminated by the community. 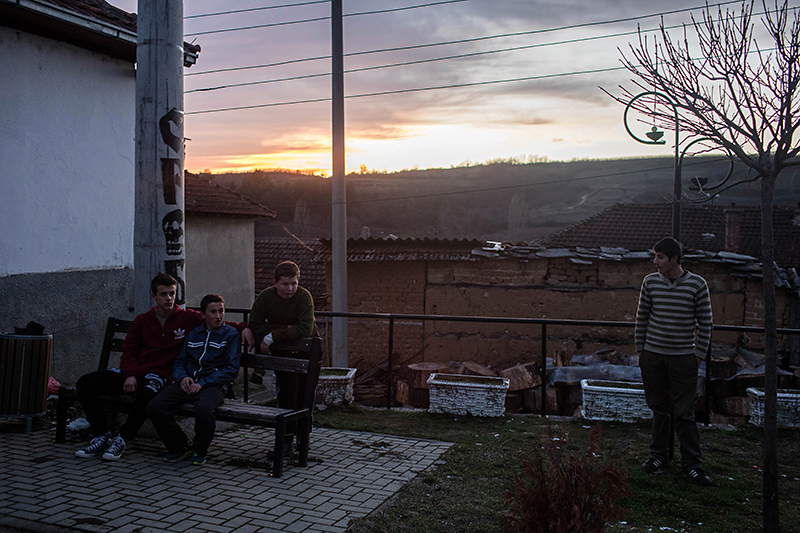 Kids from Serbian enclave Velika Hoca spend their free time in the center of the village. Behind them is a Serbian nationalistic sign written on a pillar. With relative normalization of the situation in Kosovo, this enclave is not any more under protection of KFOR. Still, for Serbian children, going further away from the village area represents risky adventure. They go on organized excursions or tours with school, all together, but othervise they spend time here in the village. 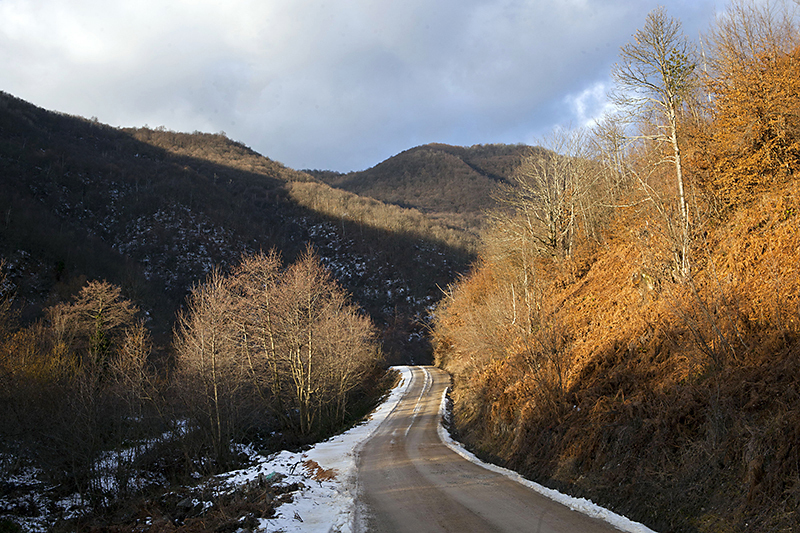 Beautiful scenery of Prokletije mountain range is surrounding monastery of Visoki Decani. The path around monastery is used by KFOR whose branded armed wehicle passes every few minutes. From these hills monastery was targeted with a mortar in 2000 and 2004. Today it's still under constant verbal treath by local radical Albanians. 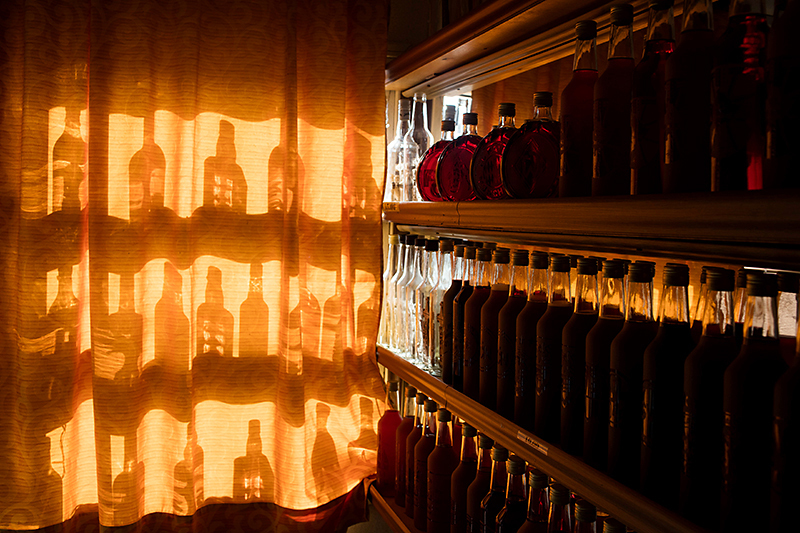 Branded rakia with Serbian symbols is lying on the shelves of a small store in Velika Hoca. People from this area can hardly find jobs in very shattered Kosovo economy. Although many of them received sallaries from the Republic of Serbia until recently, it was barely enough for survival. Today families are trying to revitalize businesses of making vine and rakija in this fertile area. The process is followed by many administrational and practical obstacles, especially due to the fact that main target market for these products is Serbia. Christmas service is held in the church of monastery Visoki Decani in Kosovo. People from nearby villages and from all over Kosovo, as well as many guests, attend liturgies in the days around Christmas. 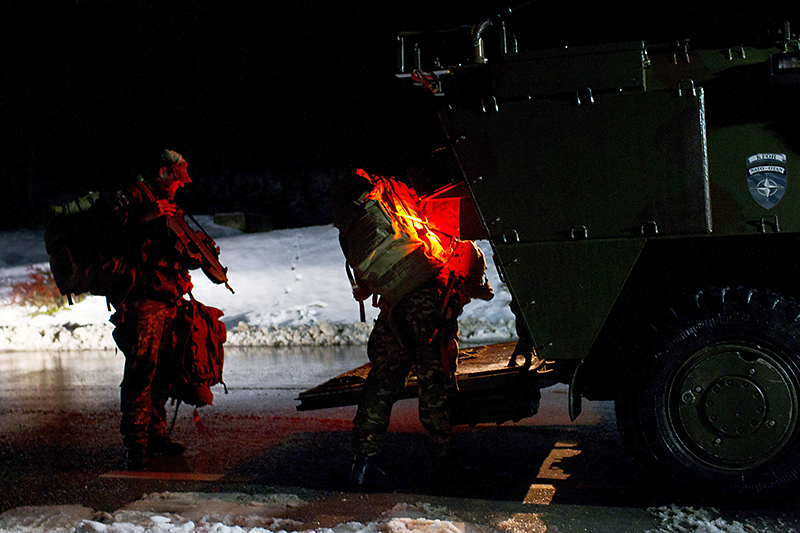 KFOR soldiers who are in charge of protecting the monastery Visoki Decani are changing shifts couple of times per day. The soldiers are comming from different countries like Italy, Austria, Moldova or Ukraine. After some period spent in service here, they usually develope special kind of relationship of respect and adoration with the monastery and priests. 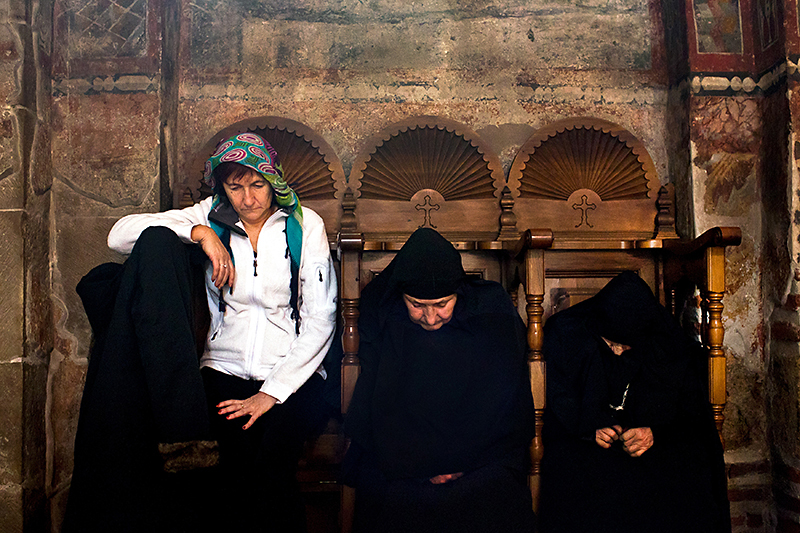 Two nuns and an older women came to monastery of Visoki Decani to conduct Christmas prayers. 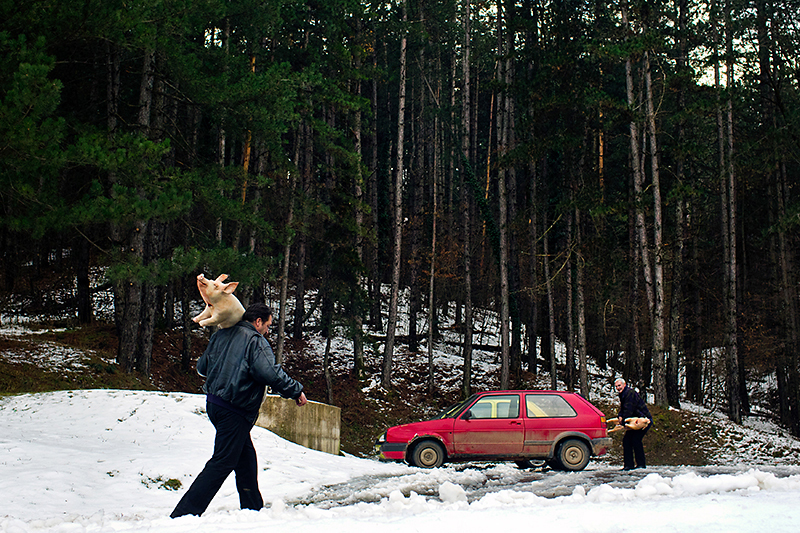 They are the only remaining Serbian residents of the town of Djakovica in Kosovo. Before the war, number of residents of Djakovica who were Serbs was 12.000. Serbs are heading back to their homes in northern part of divided city of Kosovska Mitrovica after the Christmas service held in the church of Saint Dimitrius on the hill overlooking the city, followed by the firework and heavy downpour. Kosovska Mitrovica is the best known example of the city where Serbs and Kosovo Albanians live in complicated coexistence, divided by the river Ibar, politics and religion. A priest holds devoted prayers on Christmas morning 2016. 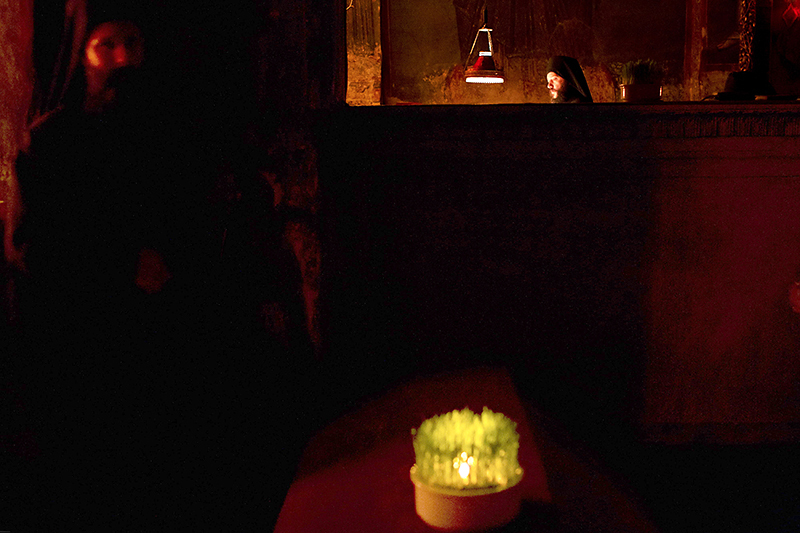 Beautiful light of candles illuminates interior of one of the most sacred places of Serbian Orthodoxy – church inside the monastery of Visoki Decani in Kosovo. Yet, the sight is unusual, with priest being surrounded by two rows of uniformed soldiers. The badges of brigades on the shoulders reveal their countries of origin. A prayer for peace and prosperity in front of uniformed man is just a kind of absurdity among many that could be found nowadays in this piece of turbulent land. *The story has been made on assignment for National Geographic Serbia magazine as part of the project of Ministry of Culture and Information of Republic of Serbia. *note: Every photo in the story has it’s own caption which could be read by dragging the pointer over the bottom of the photo. Photo and text by Marko Risović © Kamerades. Any use without written permission from the author is strictly forbidden!